It’s smoothie time again and we just made a delicious fruity concoction that is sure to please your taste buds. First off we started with a large organic ripened mango. To tell if your mango is ripe press on the skin all around the fruit. If it is firm then it needs a couple of days to ripen. If it gives and is slightly mushy to the touch then most likely it is ripe. You don’t want to wait too long since it will then be difficult to cut and peel. After washing the outside of your mango take a slice out of the bottom of the fruit. This way it will stand on its own. Then from the top make vertical slices about 1 inch apart to the bottom of the fruit. After this take a small slice from the top of the fruit. Then peel the sections of skin off of the fruit from top to bottom. It should not be too difficult to peel off. If you see allot of fruit stuck to the skin then use a knife to slice or scrape it off. Once the skin is off you slice the fruit off in sections. See this short tutorial with photos How to cut a Mango in 3 easy steps. It is now ready for the blender. Next you take about half of a pineapple, core it and remove the skin. Cut the pieces into cubes and then put those in the blender with the mango slices. You can then add a banana and 5-10 ice cubes. Run the blender on its highest setting for 1-2 minutes. Depending on how thick or thin you like your smoothies you can add water or more ice to the mix and blend some more. Serve in a tall glass with a pineapple slice garnish if you like. 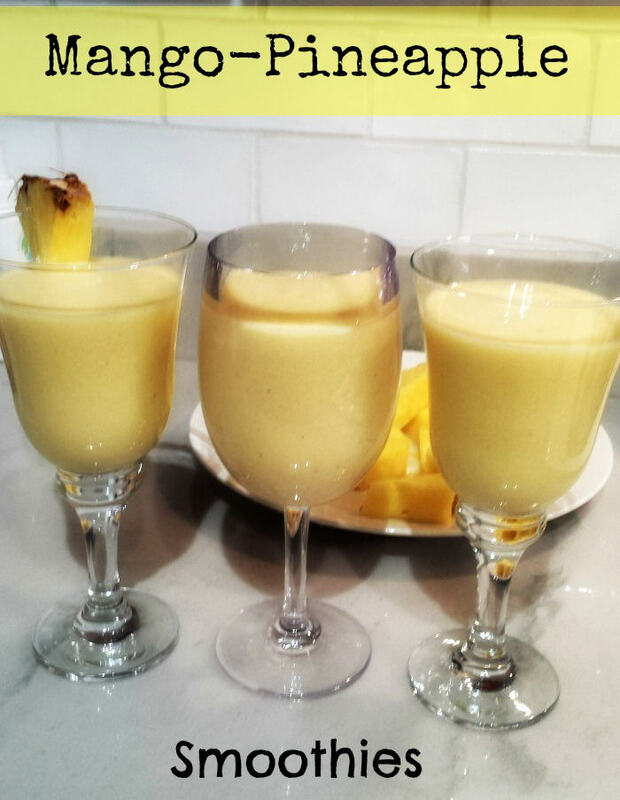 Let me know what you think of this mango pineapple smoothie recipe?